In my earlier posts, I posted about how to restore your iPhone using iTunes. Many people want to restore their iPhone/iPad or iPod to be restored without using iTunes. Yes, it’s totally possible to restore your device without using iTunes. You can restore your iPhone with iCloud. It is the easiest process to restore your iPhone data. You simply need to follow some steps to restore your iPhone using previous data backup or change it into factory settings. Backing up your iPhone/iPad data is very important. People do it so that they can transfer all their content whenever they purchase a new device. While there is also a chance there something might happen and you lose all your data then backup will help you out in restoring your iPhone just like before. Once you tap on “iCloud”, you ‘ll get an option “Backup”. Click on it. 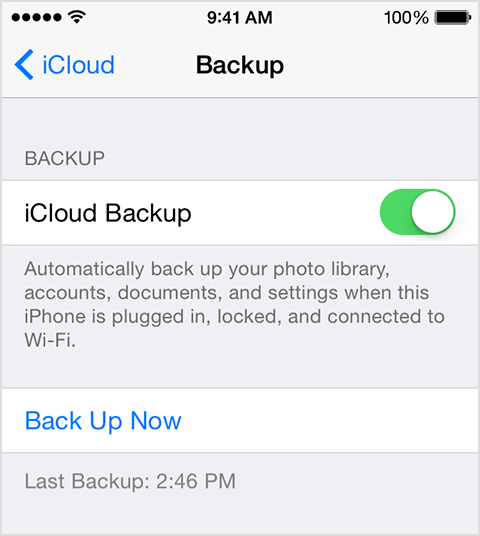 If your Backup Now option is switched off then you need to toggle “iCloud Backup” to ON mode. It will make sure that Backup works fine. Now select the option “Back Up Now”. This process may take sometime depending upon the amount of data you have in your iPhone.. During this process, you should be connected to a wireless network. Now you can go to : Settings > General > Reset > Erase All Content and Settings. It will remove all the content from your iPhone/iPad/iPod. Now when your iPhone restarts, choose “Restore from iCloud Backup” Option to restore everything completely. It will take some time and you must be connected to internet. You can use also this data for you newer devices. Whenever you setup your new device say iPhone 6 or iPhone 6 Plus,you need to choose “Restore from iCloud Backup Option” and it will install everything from iCloud. You must keep in mind that you must use the same Apple ID that you used from your backup else it will create a problem. The apps and settings will be reinstalled once the restoring is done. Moreover, if you want to recover your deleted pictures of your iPhone, it is very easy if you do it using PhoneRescue. Connect your iPhone to your computer system using a USB cable and open PhoneRescue. Click on the option “Chose Recover from an iOS device”. Under Media data, you can select your photo library, camera roll and photo stream. It will start scanning your iPhone data. All your deleted photos will appear, you just need to select them and click on “Recover”. All your deleted photos will get saved in your computer. Once the recovery is done, you can sync them to iPhone with iTunes. Above operation can be performed on all available iPhone like iPhone 4, iPhone 5 and latest ones. This entry was posted in Best iPhone Tips and tagged How to Restore iPhone 6 Without iTunes iOS 8, How to Restore iPhone from iCloud, How to Restore iPhone from iCloud Backup, How to Restore iPhone from iCloud iOS7, How to Restore iPhone using iTunes Offline on October 20, 2014 by satyenhacks.